If you have been looking for a camping holiday punctuated by the sapphire blue waters of the Mediterranean, you will not be disappointed with what this luxury camping site has in store. Not only will you have immediate access to the beach, but family-friendly activities will keep you coming back for more. One of the main features which has served to define this sense of camping luxury is the proximity of Le Dramont to the Mediterranean Sea. In fact, these shores have become famous for their scuba diving attractions. 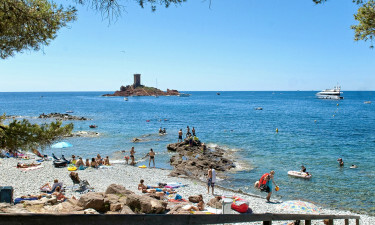 Such amazing beaches are then accented with mobile home pitches, views of the nearby Ile d'Or, baby changing facilities and numerous sightseeing options. 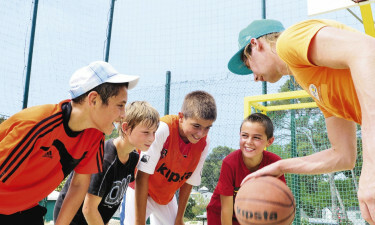 Why choose camping Le Dramont? Facilities to accommodate anyone with mobility issues. Sanitary facilities and washing stations. Please speak with a LuxCamp representative to learn more. Any camping holiday here will be enhanced thanks to the presence of a large open-air pool. This pool is open between early June and late September. The pool is 230 square metres and it is adjacent to a solarium. The beaches here have enjoyed a long history and some claim that they were the inspiration for the novel “The Black Island”. Swimming, surfing and scuba diving are all possibilities. In fact, there is even a dive school found directly within this holiday camping site.